Last night we had a Control Station failover on VNX7500 and before we could fail it back (Change Control etc etc) I needed to create a new Service Offering in EMC UIM/P. Naturally, I logged into UIM/P, changed Control Station IP address in the Vblock configuration and ran Vblock discovery again. 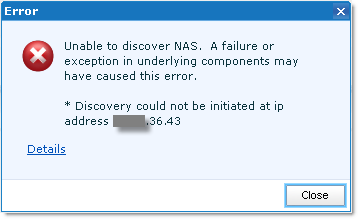 Unfortunately, it failed on Control Station discovery. ----> Refer additional details below. Disclaimer: .vstrong.info is used to protect the guilty. I re-configured DNS domain name, NTP server IP addresses and the timezone which were also wrong. Discovery should now finish successfully!